There are two very important questions that A Course In Miracles wants us to ask before we begin anything, "What do I want to come of this? What is this for?" (T 340)(T 365) Since this is a new year, I thought these might be good questions for us to ask ourselves here at the Community Miracles Center. These are important questions pertaining to our study of A Course In Miracles. These are important questions surrounding the issue of churches and our involvement with them and these are very important questions to ask about the C.M.C. itself. What do we want to come of our new year and our study of the Course? What are these organizations, or churches, that study and teach the Course for and how does the Community Miracles Center fit into the whole picture? Let's ask these questions? This newsletter goes out to over 1,750 people. You 1,750 who have received this issue and who are reading this article are sharing in an experience of study of the Course and participation with a Course church (the Community Miracles Center). What do we want to come of this? What is this for? People who receive this Newsletter write us all the time. Frequently the letters are supportive and complimentary, but definitely not always. Many people have been "guided" to share with us how "misguided" they believe us to be. Especially around the issue of "church." "Don't you know the Course wasn't meant to be a church," they state emphatically! "Drop the 'Rev.' title Tony, don't you know we're all teachers of God and that none of us have 'special' knowledge to share," is another oft mentioned sentiment. Dear Rev. Ponticello,I do not care much for your newsletter — both the tone and format are a little too garish and florid for my taste — but because I do support A Course In Miracles I keep reading it. I have even deliberately refrained from contributing in hopes you would remove me from the mailing list, but to no avail. And as the timing of the universe would have it, the last newsletter came when I was half-way through the 40 day prosperity plan and your lead article, "Only The Abundant Can Be Truly Charitable" got my immediate attention. (See Vol. 7, Issue 6, July '93) It reminded me that the seeming paradox of the above statement is also true — "Only The Charitable Can Be Truly Abundant." Do letters like this bother me? Absolutely not. I love them. At least this woman has an idea of what she wants in Course Newsletters. She obviously prefers the less "garish" and not so "florid" style that several other Newsletters have. ("The names will be withheld in order to protect the innocent.") Anyhow, "garish" and "florid" are not the worst adjectives that this Newsletter has had to bear. Maybe it was the "garish" and "florid," or shall we say open and flamboyant style of this Newsletter that gave her the "permission" she needed to write us that letter in the first place. In which case, it served us all well and I am grateful for her comments (and her donation). Holy Spirit and Jesus seem very clear here that we all must get involved in the process of being "God's Church." What that's going to mean for each person is very different. I'm going to write about what it means for me. Everybody reading this will have to answer the question of what it means for them. I present my points of view as a way of giving you ideas from which to bounce off. 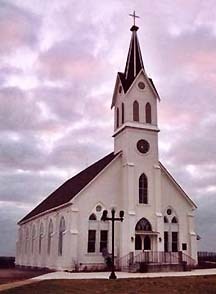 Webster's dictionary defines church like this: "any organized group of Christians occupying the same edifice for religious worship; a congregation, as a pastor and his church." The Community Miracles Center certainly fits that definition. We're a group of spiritual people. We gather physically in San Francisco and we gather in consciousness through this newsletter whether we mir in San Francisco or not. We join together for worship, a particular spiritual practice — the spiritual discipline entitled A Course In Miracles. We're a congregation. I'm the pastor and the Miracles students that gather "here," both physically in San Francisco and in consciousness throughout the entire world through this newsletter and the lecture tapes we send out, are the church. We fit Webster's standards. People always ask, "Why did you choose to form a church around A Course In Miracles?" It's not a very common thing, why did we choose to do it? The only real thing I can say is. "That's what we were guided to do by listening to the Voice for God to the best of our ability." We didn't question it at the time. It seemed to clearly be the thing to do. I can now see that it has had certain benefits. There are advantages to being a legally recognized church. In October of last year, I had the privilege of spending a short time with Gloria and Ken Wapnick at their wonderful retreat facility in Roscoe, NY. (Foundation for A Course In Miracles, 1275 Tennanah Lake Road, Roscoe, NY 12776) Gloria was talking about how their Foundation (and they're not organized as a church) had bought their beautiful resort property in the Catskill mountains and she told me how they had run into legal problems concerning their property tax-exempt status. The local government wanted to tax them but as a non-profit public charity they should have been exempt from paying such taxes. So they had to prove to the local government that they were indeed a charity. The amazing thing was that they initially lost the case. It was only after they appealed the case to a higher court that they had the original ruling overturned and were indeed granted their rightful property tax exemption. So I asked Gloria, "Why did you loose the original case, you're obviously a public charity. What's the story?" "Well," Gloria said, "We were non-traditional, we weren't a church and we didn't have a clergy." The local government didn't think they were entitled to the property tax exemption because they weren't really a church. The world still looks for certain things and identifies them as having particular meanings. Being a legal "church" means something to the world. That can be important and Holy Spirit can use it if it is turned over to Him. Even though many of us may have rebelled against traditional symbols and the way the world is organized, there are certain legal definitions in place and these things have their advantages. Part of the reason the Community Miracles Center is indeed a legally recognized church was because of these legal advantages. I have no trouble every year declaring and receiving our legal property tax exempt status from the county of San Francisco. (San Francisco county assessment number 91-015275, account number 153526-001) The constitution of the United States of America guarantees the separation of Church and State. As such, churches become, in a manner of speaking, "above the law." For that, I say, "Hallelujah!" Another thing that I believe is very important is the way other religions deal with us. Until a spiritual movement has "church" status it is frequently thought of as a "cult" and that has a very negative interpretation and more often than not scares people away. Many people will not come near A Course In Miracles because they believe that it's a cult. "It isn't a church, is it?!" A recent issue of a Fundamentalist Christian publication named "The Plain Truth" (September 1993 — publishers, The Worldwide Church of God) had a very interesting cover article about A Course In Miracles titled "The New Age Seduction." In the article, which by-the-way was fairly accurate with it's information about the Course, the author made a lot of headway out of the fact that the A Course In Miracles groups met in the "basement" of a bookstore. He used the "basement" analogy over and over again. The obvious inference was that A Course In Miracles was an "underground," subversive, cult movement which taught that: Jesus did not die for our sins, the New Testament contains "upside-down thinking" and that sin does not even exist! Such heresy and perversion definitely made the Course and it's teachers something to avoid, according to author George Hague. The article even sported a smiling picture of Marianne Williamson almost saying to faithful Christians "Watch out for her!" Would "The Plain Truth" have talked about Buddhism this way? Would Hinduism been referred to as a dangerous "cult?" Would even the more contemporary Christian Science, Unity School of Christianity or Religious Science been cast in such darkness? I don't believe so. Why? Because they're valid, legal and organized Churches in their own right. They don't meet in the basements of other churches. They've come up from the "basements" and now stand shoulder to shoulder with every other world spiritual religion. Isn't it time we students of A Course In Miracles stood shoulder to shoulder with The Worldwide Church of God. We can stand shoulder to shoulder with Unity and Religious Science too. The Episcopal Church does not have a legitimacy that we cannot have. The Roman Catholics don't either. Why do we continue to attack the world's religions by perceiving that the words "church" and "religion" are dirty. They're just words! They're just forms. Symbols can be useful. Holy Spirit can use it all. Students of A Course In Miracles have as much right to proudly gather and to validly worship as any other seekers. We have the same rights and privileges other religious people have. Our discipline is as valid and honorable as theirs. We are as worthy of respect for our views as any of them. This country is founded on such rights! That's why church and state are separate! Remember? Roger Walsh, M.D., Ph.D., professor of psychiatry and philosophy at the University of California at Irvine and noted author and lecturer has focused primarily in recent years on just how valid A Course In Miracles is. He calls it another expression of the "Perennial Wisdom" that has sparked all the major world religions. He seems to be able to use the word "religion" without quivering. While he does not directly say that we should think of the Course as a religion he definitely implies that the Course is on par with any of the great religions and gives us definite criteria to judge the difference between a cult and a major spiritual / religious discipline. I commend him for leading a movement up from the "basement" to a shoulder to shoulder stand with all religious / spiritual people. There is a tendency early on in movements to be a "rebel." There's a tendency to think that there is something wrong with the structure of society and in order to change it I need to rebel against it. Tom Hayden comes to mind. He was a leftist rebel who worked against the system for years. Remember the "Chicago 7" who were arrested for violently disturbing the Chicago Democratic National Convention in the late 60's? He was one of them. He was a violent revolutionary. At a certain time in his career as an architect of change he decided that he could effect much more change if he worked within the system instead of outside of it. So he started running for public office and he, eventually, was elected. Now he's a member of the California State Legislature. He's now within the system he was once outside of and trying to overthrow. Has he "sold out"? I don't think so. I think he just found a more effective way to do the work he was trying to do. Change can happen much more smoothly by evolution than by revolution. I know that many of us have had negative experiences with churches and the doctrine and dogma they seemed to impose upon us. I absolutely think we can effect much more change by working within the system of "church," and evolving "church," than we can by constantly being outside the system and working in a "basement" mentality. Much of what we do here at the Community Miracles Center is to bring respectability and normalcy to the teaching of A Course In Miracles. I will not accept being a "cult" in a basement. We have as much validity as any other spiritual system. We are worthy to play with the "big boys." Church — what does it mean to be a church? As I thought about this idea I saw that churches basically serve two purposes or needs. They are: 1) the social / relationship aspect that a church is and 2) the spiritual teaching that the church provides. In picking a church these are the two criteria with which to evaluate the organizations. I actually think that both of these are extremely important. They both have to be in place, and working, for the church to be viable. You can't ignore one at the expense of the other. Unfortunately, some churches do just that. Some churches get really into the social aspect with it's relationship matrix, the focus on family support and community service — and while that's good, if the spiritual foundation is not there it will never work for those individuals. I have seen the other extreme even more frequently. This is where people get together and are so focused on the spiritual teaching that they neglect the relationship aspect and do not meet the needs of individuals, families and communities. Those organizations don't work either. Let's look at the social / relationship aspect closer. I remember when I was in college at Cornell University I took a Course, an elective, on relationships. It identified five types of relationships and presented them as a hierarchical system. At the foundational level of relationship there was the personal intimate relationship, the kind you had with one other person, usually a husband, wife or lover. This was the basic ground level of relationship. At the next higher level there was the relationship you had with your family, this could be your biological family or an "extended family" of friends and closer associates like roommates. The next level, the third level, was the relationship you had with groups and organizations. This is the level that church fits into. Church is an organizational / group structure. At a higher level than that there was the relationship that you had with your community. San Francisco, while being a community in and of itself is also made up of many other smaller communities: the Gay community, the Latino community, the Asian community, etc. Finally, at the highest or fifth level was the relationship that you had with society as a whole. I don't really believe these relationship distinctions are hierarchical. As I was taught at Cornell, one had to get the foundational level of personal / intimate relationships in line before one could effectively and successfully have good family relationships and the family relationships had to be working before one could responsibly and dynamically relate in organizations and groups. On up the ladder it went. I don't believe that this is the truth. I think all our relationships merely reflect the relationship we have with God. If your relationship with God doesn't work, none of the other relationships are going to work. If we get our relationship with God powerful, supportive and loving then all the levels of our relationships take on the qualities of power, support and love. Our intimate, family, organization, community and society relationships all become means to receive power, support and love when our communication with God clears up. It all works together. This is why I think our relationship with our church is very significant, because it's the interaction which really helps us to develop a relationship with God that really will work. That's why we shouldn't ignore church and why it's important to focus on our relationship with church at this time. Churches can provide the structure and the context in which to fit the rest of our mirs. Churches are always there. Church is constant through all your life passages. Church is there when you get married (the traditional church wedding), and church is there when your marriage gets into trouble (couples go talk to the minister when their marriage is having a rocky time). Churches are there at birth (baptisms) and at death (memorial services). Churches are there when you get a new job and when you get accepted into a university and they're there when you get fired from that job or when you decide to quit the university. Your church is that organization structure which is constant through the life passages that sometimes are very traumatic for us. They provide a stable relationship context into which we can fit the rest of our mirs. The social / relationship aspect of church is important because without it we put way too many demands on family relationships and our intimate personal relationships. We look to family and one to one relationships to provide all the juice, stability and contextual continuity to our mirs and the truth is that they can't. They fail to provide the stability we're looking for because they change so drastically when individuals within them change. The real places that can provide the context of continuity we feel we need are our churches and organizations we belong to. People have used AA and other "12 Step" programs for just this reason. No matter what is happening in their mirs they can always go to "a meeting" and get a hit of purpose and support. They feel better because they have reconnected with something sure, spiritual and stable. It doesn't matter what individual people may be at the meeting they go to, the meeting exists regardless of the particular people. Churches can, and do, fill this need. Since churches are traditionally more openly spiritual, the potential is there for an even greater connection to life purpose. Also, since churches deal directly with healing our relationship with God the ability for the church organization to really heal all our relationships and thusly heal our mirs is even more profound. I wouldn't be without it! Another thing that churches are really good for is the holidays. We've just been through Thanksgiving and the Christmas / Hanukkah season. That is always a very purposeful and divine time for me because, as a church, we're very involved with the holidays and providing people with an experience of joining and joyful celebration. I remember what the holidays were like for me before I had the church context to fit them into. They were okay. It wasn't that they were terrible. I don't have immediate family out here in San Francisco so the holidays usually meant getting together with some friends or extended family and while this was fine I remember that the last year I did that I had the perception that there was something very "hallow" about it. It just sort of didn't do it for me anymore. The next year Rev. Larry and I got together and said "Let's do something for all the people who mir out here and who don't have family to spend the holidays with." That basically meant us and anybody who wanted to join us. So we now get together with a larger, greater more eternal "family" which doesn't have the limitations that our biological families had because they were so far away or non-existent. I've never had such wonderful holiday's as I've had since I've spent them with the people here at the Community Miracles Center. Forty five had Thanksgiving dinner with us this year. I roasted three twenty-two pound turkeys, baked eleven pies and made two gallons of cranberry sauce! My C.M.C. holiday family is so much more diverse and ethnically varied than my biological family. It's a blast to be around these people. Providing events for the holidays doesn't generate from an altruistic place of service to the church, as much as from a place of real service to myself. It serves me to be around this energy during these very important times of the year. It solidifies my own connection to a church family of like minded devoted people that then gives the rest of the year context and meaning. Somehow spending the holidays with our miracles family is holidays on a "higher order." Why is church a higher order than family? There's just something eternal about church. Church isn't just the individuals involved in the church. The individuals come and go. The ministers can come and go. I can come and go but the church itself survives the separate coming and goings and is always there. So it's a breath of God, of "eternality," that comes into our mirs and gives them stability. Let's face it, our intimate personal relationships are very unstable. If someone leaves the relationship, it really upsets your world. If someone leaves your family, let's say a parent dies, it really changes your family. But church survives these things. Church is at a level of relationship that is somehow more than the sum of its individual parts. So it brings to mind something more which we are. We've been running a Miracles church here in San Francisco since 1985 and in these nine years I have found that it is frequently difficult to keep all of this going. I was wondering about this. In October I went back East to visit my family in its small town of Canastota in upstate New York and when I went to church there with my mother (St. Agatha's Catholic Church) I noticed something. What I noticed was that the people there didn't seem to be questioning and judging what was going on in the church. They weren't arguing with the priest. Many weren't even very aware of what the priest said during the sermon. They seemed to think of the sermon as "nap time." After the mass I asked several people what the priest had talked about and no one could tell me. He got no interaction at all during his talk, no one applauded him when he was done. No one laughed. No one made a sound. It was as if they had blanked out — as if they were watching television. While this contrasted drastically with the dynamic interactions and discussions that go on here at the C.M.C., I did see that it had an up side. The people in the small town of Canastota, New York had much more faith in their church than the people who come to the Community Miracles Center. Here they question and challenge everything. In Canastota, the church attendees seemed to be at peace with their experience. Here, everything that I do or say seems to come under constant scrutiny. Like the letter I included earlier, we're open to feedback and we get it! I asked Holy Spirit for guidance about this and this is what came to me. So many people out here in California are transplanted. So many people out here came from dysfunctional families. Those who came from dysfunctional families, families that didn't work very well, felt that they had to leave. They had to go as far West as possible. San Francisco is as far West as you can get. (Unless you get on a boat or plane and go to Hawaii!) The trouble is, when we arrive in the West we just bring our dysfunctional baggage here with us, because the truth is the dysfunctionality is really in us. It's not within our families and it's not within the churches that we were involved with back there. It's in our thinking, our perceptions. We come to a new place, but there we are again so guess what — if you think Mom and Dad didn't run the family well, you'll come to the C.M.C. and think that Larry and Tony aren't running the it very well either. We bring our perspective with us. So while it's been difficult to run this church I have to admit that I'm part of this process to, I moved West along with everybody else. It's part of the context of running a New Age church here in San Francisco. I've made my peace with this process which includes getting a lot of "flack" from the "parishioners." I ask the Holy Spirit for help all the time. These are my thoughts on the social / relationship aspects that all churches function under and some of the more specific issues that face the Community Miracles Center. Yet let's not forget that there is a spiritual teaching that church provides and that this is vitally important too. You can't have a successful church if that's not there. The Community Miracles Center follows a spiritual teaching called A Course In Miracles. No matter what else we may do, it's always going to come back to that. A Course In Miracles is a very particular spiritual discipline that teaches a very particular spiritual philosophy. If you don't embrace that spiritual philosophy, even if you love all the people here at the C.M.C. and are really into all the social relationship things we provide, you probably won't embrace this as your church, because it just won't work for you. So just what is the spiritual philosophy that A Course In Miracles is? I'm going to do something as test for myself here and now, hither to, never been done. I'm going to attempt to comprehensively summarize the entire teaching of A Course In Miracles in 450 words, which is the amount of words that you could read out loud at a steady but unhurried pace in about three minutes. You can test it yourself if you have a watch that has a second hand. Just start at the beginning of a minute and read along steadily but without a sense of hurry and you'll see. Will you accept the Course summary challenge? Can we summarize the teaching of the Course in three minutes. Are you ready. Here goes. In the beginning, humankind was whole and perfect and a part of all that really existed. This humankind was created by a huge intelligence of love that we call God, and this creation of God is called the Christ. Love is the energy and substance of God and the created Christ. God, Christ and love are real and eternal. That's all that exists. Everything else is an illusion and is temporary. Into this reality a false idea came into the mind of Christ. This was the idea that the creation of God could somehow exist without there having been a God which created it. Having this idea itself was not the problem. The problem was that the mind of Christ decided to take this idea seriously or, in other words, it forgot to laugh at this insane idea. That was the original mistake, or what traditional Christians might call the "original sin." Out of this original mistake a whole world of illusions came into being. This world of illusions is the three dimensional world of time and space that we seem to find ourselves in. Since this world is based on the false idea that the Creation of God could somehow exist apart or separate from its Creator, because it is based on the idea of a cutting off from love and light, in this world are the dark illusions of sickness, death and war. This world thus reflects the mind's denial of life. This world is a dream, an illusion; it is not real. However, since we are still actually connected with God, there is a Voice in our minds, the Voice for God, which constantly reminds us of what is real. This Voice is what the Course calls the Holy Spirit. The Holy Spirit is in a continual process of correcting the errors that are in our minds, or our errors in thinking, which are the only kind of errors there are. Once we learn, through the help of the Holy Spirit, that we are dreaming this world that we seem to find ourselves in we learn that we can change the dream. Through forgiveness and through non-judgement, we can gradually correct, or atone for, those original ideas of separation that we forgot to laugh at. As we correct those, sickness death and war gradually get healed and the world begins to reflect health, life and peace. Through forgiveness and non-judgement the world gradually becomes healthier and happier. When the dream world, which is this world, reflects only health and happiness it becomes what the Course calls the real world. Once, we have entered this whole and happy, real world God wakes us up, and the illusion of what never was simply ceases to be. So here it is, the three minute Course summary. How did you do? That's the whole though system. Learn it. Obviously we don't learn by just memorizing the ideas, however the point I'm trying to make here is that the thought system of the Course is not so complicated. We can effectively summarize it in three minutes. Those idea are what form the spiritual basis of this church we call the Community Miracles Center. As much as we may talk about the social / relationship aspects we can never forget that this church is founded on those spiritual principles. So let's go back to the questions I asked at the beginning of this article (oh so very long ago). What is this church for? Well this church is really about those relationships and that spiritual teaching tied together so that we can provide a context for our mirs which we can then bring everywhere and "every-when." We must own up to our own dysfunctionality to choose to heal it. Once we choose to heal that, all of our relationships will reflect that healing. The Community Miracles Center is definitely my church. It's my social, spiritual organization relationship. I want everybody to know that however you choose to participate with us, wether you're someone who comes to our Sunday Services, our retreats or workshops, or even if your just someone who only reads this from thousands of miles away, you're all participating here with this organization and you're all in relationship with us and you're all a part of this church. This church opens its doors or, in many cases, its pages to everyone as all good churches should. If you find that the social / relationship aspect of this church suits you (if you feel like family with us) and if you find that you resonate with those spiritual principles (that you know they are the truth for you) then I can't see how you can come to any other decision but to join with us and consider yourself a part of this spiritual family, this church. Come heal with us, learn with us, love with us and get involved with a healing energy that will heal your relationship with God and thusly heal all your relationships. Take the pressure off your intimate personal relationships and your family interactions. They were never supposed to provide you with the eternal context of love and learning. Get involved with your new church and its divine work of healing the world and eventually we'll all wake up back in heaven, where we belong, still in the arms of God. We extend an open invitation to be a part of our church. Whenever you open these pages you enter our doors and our hearts. God is waiting within. Our path is valid and vital. The "perennial wisdom" of A Course In Miracles has found a new home in a new house of God. The Community Miracles Center is another of "God's churches." Shoulder to shoulder with any other church or cathedral ever built, we will meet the world on the world's terms, but with the divine inspiration of the Holy Spirit in back of these symbols. There is much work to do. © 1994 Rev. Tony Ponticello, San Francisco, CA – All rights reserved. This article appeared in the January 1994 (Vol. 7 No. 11) issue of Miracles Monthly (then named *California Miracles Center Newsletter*). Miracles Monthly is published by Community Miracles Center in San Francisco, CA. CMC is supported solely by people just like you who: become CMC Supporting Members, Give Donations and Purchase Books and Products through us.